The award-winning Withings ecosystem of connected health products will launch under the iconic Nokia brand in early summer 2017, including connected scales, trackers, blood pressure monitors, thermometers and home cameras, bringing beautifully designed devices to the global consumer market. At the same time, Nokia will also unveil a redesigned Health Mate application. Nokia's proven, medical-grade connected health products will also extend further into the healthcare system through the launch of the company's Patient Care Platform, enabling physicians and patients to manage chronic conditions such as hypertension. Health Mate is at the center of the digital health ecosystem and collects data from scales, trackers and other connected devices in one place to provide a 360-degree view of health. Coinciding with the product rebrand, the Health Mate application will undergo a redesign for an improved user experience. The redesigned app will make it easier to add devices, share progress with family members, and will introduce new in-depth coaching programs. The coaching programs will take users on an eight-week journey to achieve a healthy goal along with personalized experiences to better manage health and wellbeing. Nokia will also roll out the company's HIPAA-compliant Patient Care Platform designed to transform the relationship between patients and healthcare professionals. The new platform will give doctors and care teams the power to remotely monitor patients with their smart devices to help prevent and manage chronic conditions and drive timely and targeted patient care to avoid unnecessary office visits and hospitalizations. The platform is being used by the National Health Service in the UK in a 69,000-person study to better understand hypertension and the role of remote monitoring in lowering hypertension rates. 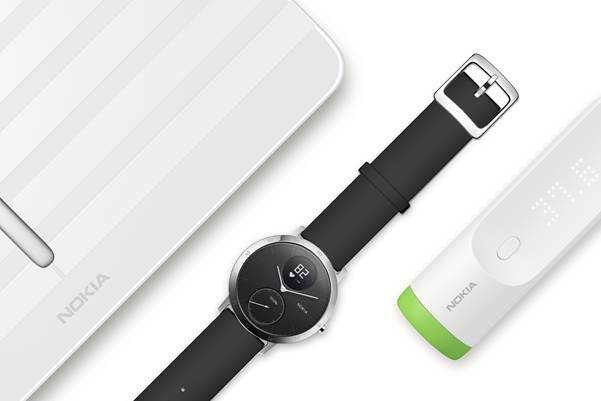 The new Nokia branded connected health devices will be available early Summer 2017 via Nokia's website and retail channels including Amazon, Best Buy US, Best Buy Canada, Bed Bath & Beyond, Target, FNAC in France, John Lewis in the UK and Saturn in Germany. The redesigned Health Mate application will coincide with the rebrand.